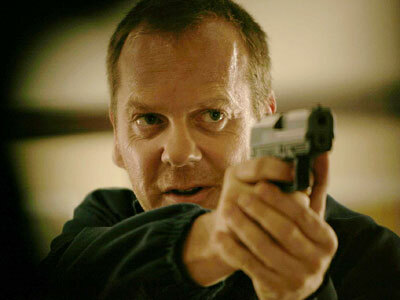 Kryptonian Warrior: Kiefer Sutherland Returning As Jack Bauer In New 24 Series! Kiefer Sutherland Returning As Jack Bauer In New 24 Series! Personally I haven't seen a single episode of 24 at all... I know that's bad, but I have the complete series DVD box set sitting here for me to enjoy at some quiet point in my future, so it's all good. Anyway news was released this week that Kiefer Sutherland will be returning to his most well-known and much loved role of Jack Bauer in a brand new 12 episode series reprisal called "24: Live Another Day" which will air early May 2014. Unfortunately, for some people at least, Kiefer's current show "Touch" has been cancelled, so season 2 is the last one. I'm pretty peeved at that as I wanted to see more of Touch, but I'm guessing there are more 24 fans than Touch, so I'll be outvoted on that one! No news on characters or storyline yet but this has been on the cards for a while as well as a 24 movie, so it's not ground breaking news.